Provides effective drainage system lessening water stagnation. Easy and quick to install, cost effective and highly durable. 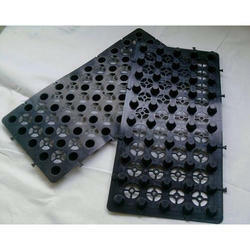 Drain Cells are perfect solution for gardening on terraces, podiums, RCC structures etc. It works as a protective layer which allows the excess of water to drain out, keeping optimum amount of moisture on perch for growth. It has great strength for usual traffic. We, royal Micro Irrigation system are majorly into designing , supply, installation of irrigation system, draincells, grass pavers, geotextiles. We are dealers of Drain cells 20 mm and 30mm thk. Its used as drain medium for terrace Landscaping. Material quality is good and sturdy. We are Manufacturing Verse cell as well as cup Drain. We offer 50 mm Drainage Cell. 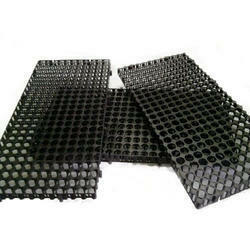 We are one of the leading Names in the market engaged in offering extensive customized Geo Drain Cells. These Drainage cells are used for controlling accidental movement for pedestrians and rapid capturing of soil water. In order to keep pace with the never-ending demands of customers, we are involved in offering a wide range of Roof Garden Drain Cell.